Margot was making unhappy noises, so I looked down to see what toy had moved out of reach. 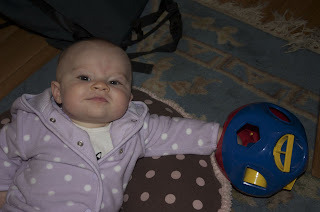 Instead, I was surprised to see Margot caught with her hand in the shape toy (you put the right shapes in the right holes). Margot had stuck her hand in to get a shape and wouldn't let go of it, so she couldn't get her hand out. Being the caring parent that I am, my first reaction was "we need a picture of this" rather than, say, helping her. At least events like this will be nicely documented for any future therapy sessions. aw i love this photograph. and she looks so content! Well, she has to learn that sometimes you have to let go of the thing to get your hand out! Thats a very big life lesson. Today, Maura (Aine's cousin) did a very similar thing. She was trying to get a book out of a play toy house...through the little door. I think we took a picture too. That must be her McKernan genes. It takes us a while to grasp something, but once we get it we don't let go.